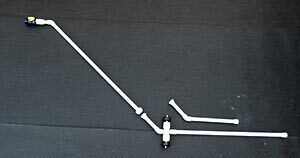 The Underwasher :: Hose accessory that lets you clean under your car, RV, boat or ATV! Do you know what's lurking beneath your car? Caked on road gunk! Periodically you should wash away this gunk under your car. 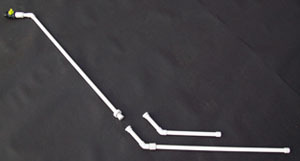 This will help the engine and transmission run cooler. Keeping the underside of your vehicles clean can also help keep rubber boots and seals remain pliable. Not cleaning underneath your vehicles can cause these rubber boots to dry out and crack, leading to expensive repairs. If you live in a cold, snowy climate, you are driving over a hidden danger to your vehicle. Roads today are being treated for ice and snow conditions with salt and liquid magnesium chloride. This chemical combination can destroy your brake lines, fuel lines and cause excessive and dangerous rust under your vehicle. The company that makes this solution, and the Government, recommends that you remove this chemical from your vehicle's undercarriage as soon as possible. The best way to do this is with water. One solution is that you can go to a car wash with an undercarriage washer. But, that costs money and may result in waiting in long lines and also recycled water from previous vehicles. For the price of 2 car washes you can own your own, easy-to-use, vehicle undercarriage washer called THE UNDERWASHER! Now you can wash these harmful chemicals off in your own driveway, easily and quickly, which will add life to your vehicle. The undercarriage of the vehicle has the majority of unwashed surfaces and debris that lead to rusted and rapid failure of vehicle components. The UNDERWASHER is also very effective on boats as sea water causes corrosion due to high chlorides, and it works great with either city or well water. You can understand how beneficial it is to have THE UNDERWASHER to maintain the life of your vehicle, boats, trailers, ATV's, lawn mowers, tractors, and much more. 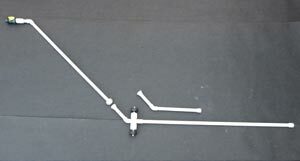 THE UNDERWASHER also doubles as a soaker hose for your garden plants. It's simple to use and versatile; a 'must have tool' for you to own! Click here to read the article on WFSB to learn more about the potential damage road chemicals can do to your car and how The Underwasher can help. 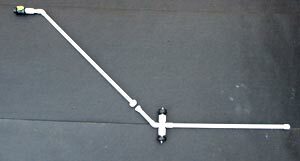 Check out the newest edition to the Underwasher family - the wheelie standard! And the Underwasher Wheelie Long for larger vehicles! Sure, the UNDERWASHER is great for cleaning under your car and removing harmful road dirt and magnesium chloride. But did you know that the UNDERWASHER is perfect for a number of other projects? - Cleaning the undercarriage of low profile cars like sports cars. - Dirt Bikes and ATVs- removes trail dirt and mud from hard to access areas. - All lawn mowers and tractors- removes wet, clumped grass clippings, dirt and debris. - Boats - easily cleans bottoms and sides. - Trailers of all kinds; utility, boat and recreational vehicle trailers. - Automobile motor and compartment-keeps motor clean and shiny. - Great for car collectors-easily removes dirt and dust from hard to reach areas of frame before painting the frame with a coating. - Car wheels- easily cleans from the front or back- cleans hard to reach areas on ornate wheels. 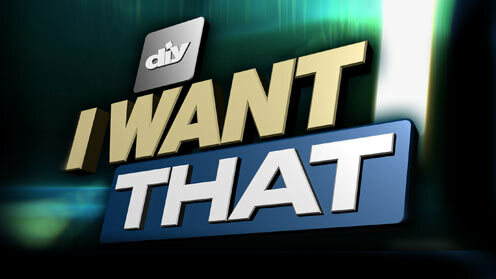 - Tops of high profile vans and SUVs- easy to reach over entire roof. - Used as a soak hose for newly planted trees, bushes and plants where you desire a slow steady stream of water to encourage new growth without having to stand and water for a long time. - Cleaning 2nd story windows. - Cleans outside and inside of gutters. 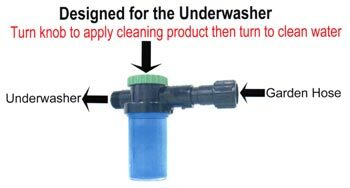 If you have any questions about the product, please feel free to email me direct at TheUnderwasher@yahoo.com. 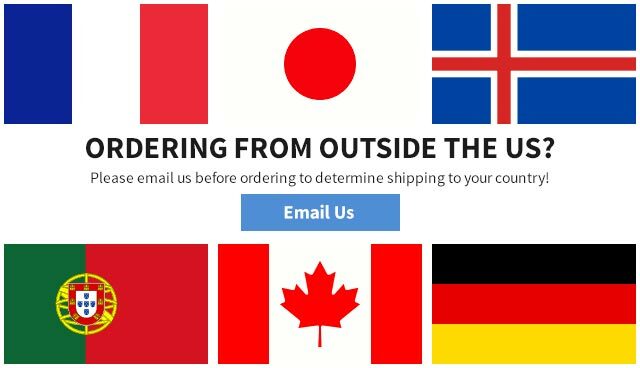 You should receive your order within two weeks, if not sooner. Swivels and rolls on 2 wheels for easy maneuverability . Swivel feature allows you to direct the spray straight up and angled toward hard to reach areas while the wheel action reduces your arm workload. Includes the high-pressure attachment. The Deluxe Wheelie swivels and rolls on 2 wheels for easy maneuverability. Swivel feature allows you to direct the spray straight up and angled toward hard to reach areas while the wheel action reduces your arm workload. Wheelie Long is 12" longer than standard model, great for larger vehicles, both commercial and residential such as trucks, motor homes, fire trucks and ambulances. Swivels and rolls on 2 wheels for easy maneuverability . Swivel feature allows you to direct the spray straight up and angled toward hard to reach areas while the wheel action reduces your arm workload. 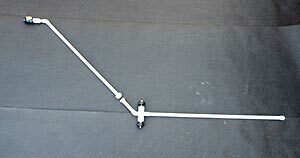 Deluxe Wheelie Long includes the high-pressure attachment and is 12" longer than standard model, great for larger vehicles, both commercial and residential such as trucks, motor homes, fire trucks and ambulances. Swivels and rolls on 2 wheels for easy maneuverability . Swivel feature allows you to direct the spray straight up and angled toward hard to reach areas while the wheel action reduces your arm workload. PLEASE NOTE: The UNDERWASHER is not included in the combo kit. It must be purchased separately. * We highly recommend SALT-AWAY CONCENTRATE to dissolve salt and leave a corrosion-inhibiting coating on any surface exposed to salt, salt water or salt air. *We will refund the purchase price of The Underwasher if you are not satisfied. Customer responsible for return shipping. To contact us, please fill out the form below or email me direct at TheUnderwasher@yahoo.com. 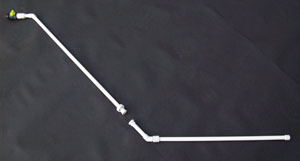 The mixing accessory is designed exclusively for The UnderWasher and fits between The UnderWasher and your hose to allow you to apply your favorite cleaning product in-line. 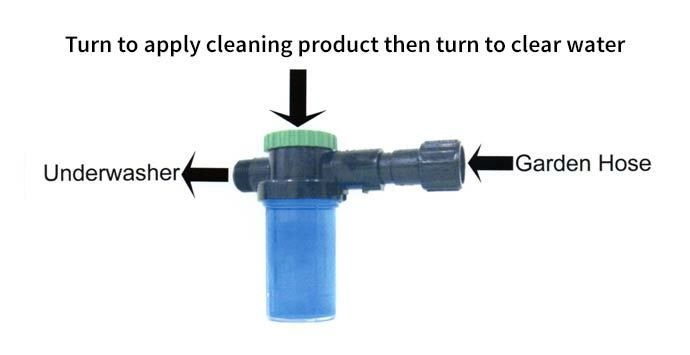 A convenient knob allows you to regulate the amount of cleaning product used, or turn all the way to clean water to rinse. 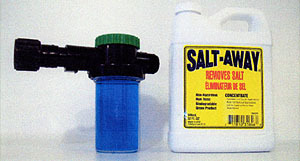 We highly recommend the Salt-Away Concentrate to dissolve salt and leave a corrosion-inhibiting coating on any surface exposed to salt, salt water or salt air. The mixing accessory does NOT include The UnderWasher. Website & Contesnts © The UnderWasher. All Rights Reserved. Interested in selling The UnderWasher at your store? Contact Us.